The ruins of Killaspugbrone church lie at the most western point on the Coolera peninsula at Strandhill, Co. Sligo. The name Killaspugbrone means 'the Church of Bishop Bronus' and relates to the original church which was founded by St Patrick in the 5th century. Coolera native Bishop Bron (or Bronus) was the son of a local Gaelic chieftain and companion of St Patrick. It is said that St Patrick lost a tooth at the site and it fell out onto a flagstone and Bishop Bron founded the church on the spot. The 'Shrine of St Patrick's Tooth' or Fiacal Phadraig was made in the 14th century for the Lord of Athenry, Thomas de Birmingham, and allegedly this shrine holds the lost tooth. The shrine is now held in the National Museum of Ireland. No trace of the original 5th century Killaspugbrone church of Bishop Bron remains and the current ruined church dates from the 12th century and is mentioned in the Annals of the Four Masters. 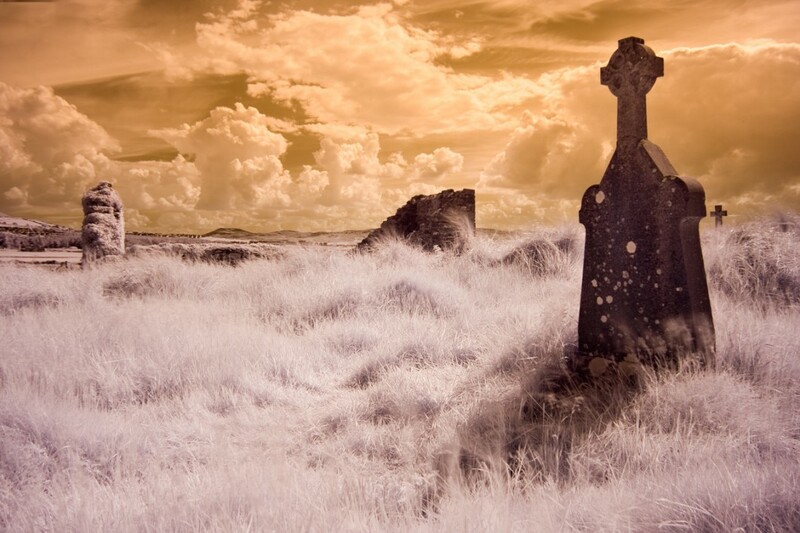 Today the church and graveyard are at serious risk of being reclaimed by the advancing sand dunes and coastal erosion.